Made by Dyslexia is a global charity led by successful and famous dyslexics. 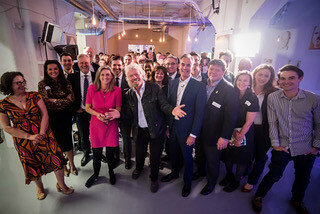 We launched in May 2017 at an amazing event supported by Sir Richard Branson. Our purpose is to help the world properly understand and support dyslexia. Working with experts, psychologists and successful dyslexics, we develop campaigns, films, tools and tests to explain dyslexic thinking. Dyslexic minds process information in divergent, lateral ways. In fact they’ve created some of the world's greatest inventions, brands and art. However many still perceive dyslexia as a disadvantage. Education systems aren’t designed for dyslexic thinking, and most teachers aren't trained to identify dyslexia, meaning many dyslexics go through life without knowing they’re dyslexic or understanding their brilliant potential. We want to ensure all dyslexics are identified, inspired and enabled to reach their potential.